Last week I set out my father's crib, whose story I told two years ago. In its 84 years it has seen war, devastation, depression, regeneration, hope, new life and much more. If it could speak it would probably tell me that 2016, though bad, is by no means the worst year it has lived through. It has seen easier Christmases, yes, but also far grimmer ones. This year I decided to arrange it on a chest by the window; on a whim I added a tea-light in a holder - and then, when I lit it, to my delighted surprise, softly glowing hearts radiated light from across the room at me! A tea-light is the tiniest of candles - but oh, what a light it can cast around itself! 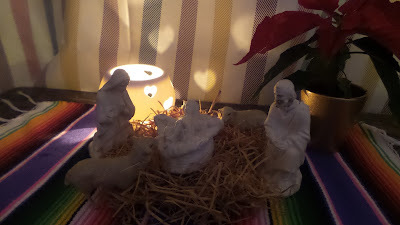 And now it's almost Christmas; almost time to celebrate the coming into our midst of that Light which came in softly glowing smallness, and somehow continues to shine out in a darkness which can never overcome it. This year especially, there is an urgency to our prayer, and our longing for this Light who is also the Prince of Peace and the Hope of Nations, and - of course - the most amazing, unlimited Love. It can feel strange but it's so very vital to celebrate love in the midst of so much hatred and violence; to root ourselves in the certainty of God, and God's presence and action in our world, in a time of increasing fear and uncertainty. May we all enjoy a happy and blessed Christmas, and may we all be people whose love glows softly in the darkness.